Whilst both lifts move people they are quite different! When deciding between the two it can be confusing. So we've put together a short blog to outline the differences between these lift types and the directives they conform to. A lift is key to the vertical circulation of people in any public building. Whether it's a simple change in level where it's not possible to provide a ramp, or the building has two or more floors that people need to travel between. Lifts also are invaluable when it comes to ensuring easy access for those with impaired mobility across multiple storeys. Lifts that move people fall into two categories, passenger lifts or platform lifts. 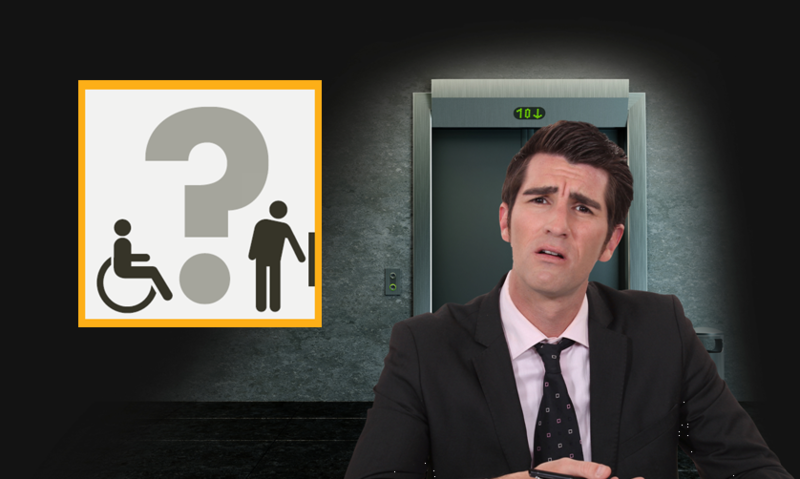 What is a passenger lift? A passenger lift is probably what first springs to mind when you mention the word 'lift'. These lifts can range in size from 3 to 33 people and beyond, though eight person is the most common lift size as it is specified in Part M Vol 2 building regulations. Passenger lifts fall under the Lifts Directive, so travel faster than 0.15m/s, allowing for the relatively rapid movement of people through a building - typically a journey takes around 18 seconds between floors. The installation of a passenger lift requires a lift shaft to be built to house a passenger car and mechanism. Passenger lifts are best for new buildings, where it is easier to build a lift shaft and create a lift pit, or where there is an existing shaft. They also make a great addition to any building where the lift will get extensive use, either due to the building size or because the lift will be the primary means of travelling between floors. See our blog Platform lifts the choices and different types for more detailed descriptions. Platform lifts speed is limited to 0.15m/s so platform lifts fall under the Machinery Directive (not the Lift Directive) so travel between floors averages around 22 seconds. Platform lifts can be used indoors or out and can also be designed for use in vertical and inclined spaces - even curved staircases. They do not need a deep pit to be dug compared to passenger lift. The floor of the lift is raised and lowered from below by a hydraulic or traction system. In situations were space is tight a platform lift can be a good solution - requiring a much smaller footprint than a traditional passenger lift. These lifts are best for low rise buildings where most people will use the stairs, existing buildings where it is not possible and/or cost prohibitive to install a passenger lift or buildings where there is a disabled access problem. Which type of lift do I need? The preference of building standards and best practice is for a passenger lift first and foremost. However, depending on the building constraints and requirements it may be the case that your building needs a platform lift. here's a neat little summary on the key differences and a little more detail on the benefits of each type. Passenger lifts are favoured where speed and capacity are prime considerations, and in particular in situations where the lift will be the primary means of travelling between floors. Typically, platform lifts are probably most suited for applications in low rise buildings where most people will use the stairs, existing buildings where it may not be possible or too costly to install a passenger lift or buildings where there is a particular disabled access problem. The case for opting for such as solution over a passenger lift can be clearly set out in an access statement. Platform lifts are also increasingly finding favour in residential settings. The smaller footprint and less onerous building requirements can provide flexibility, speed of installation and cost savings. If your commercial premises, museum, restaurant or shop has two or more floors, or changes in level within the building, then you will likely require some sort of lift if you are to provide disabled access and access for all. Here at Stannah we offer a broad range of lifts so can advise on the best product to suit your needs. To see key product requirements, building considerations and typical installation times take a look at our handy infographic.